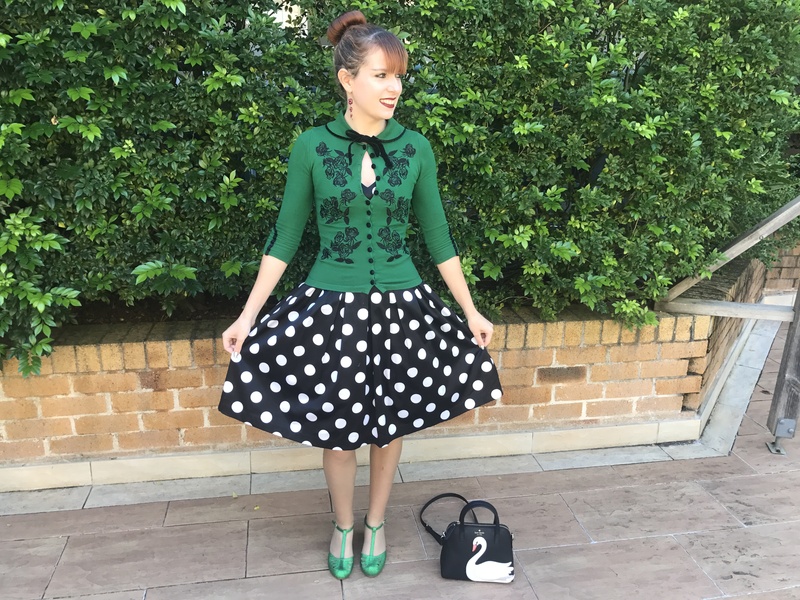 As you can see, this is the same as my last outfit post but I replaced the red Dita Cardigan and Robbie Heels with the equivalent green versions. It’s starting to become my uniform. The Dita cardigans are actually very versatile, there aren’t many dresses I wouldn’t pair them with. I don’t expect that to be the case for everyone but I’m particularly drawn to combinations which involve pattern mixing. I have seven Dita cardigans now but the Emerald version is the first one I ever owned. It’s such a pretty shade and I love green more and more over time. 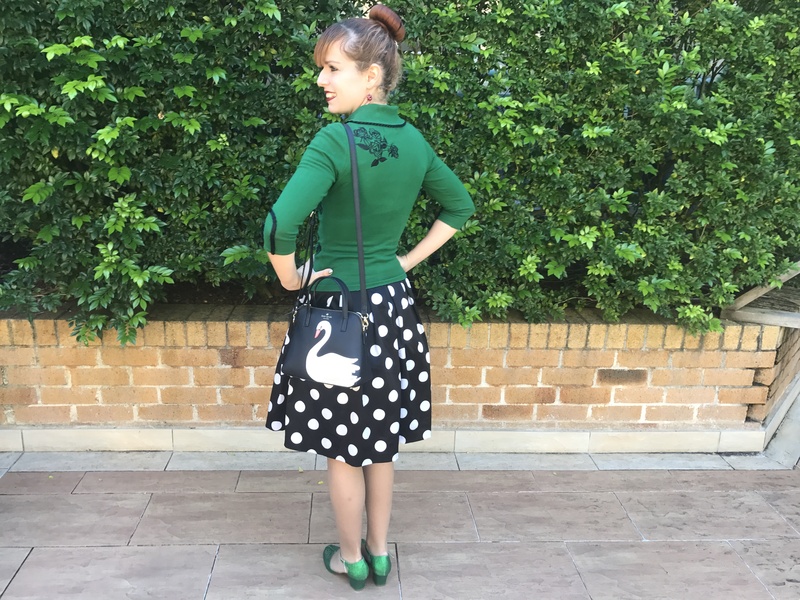 Yes, that’s the Kate Spade Swan Bag in this post (which I posted in a wishlist a few weeks ago). I was so surprised to receive it for my birthday. I adore it and have used it every day since. A bag so amazing deserves a post of its own. Happy Easter everyone! I’m enjoying the long weekend here. It’s incredible to think there are two four day weekends in a row because of both Easter and ANZAC day. It’s great to have a break because I’ve been so busy lately with training (swimming, running and tennis). More on that later. I’ve said it for the past few years and I’ll say it again- Easter is my favourite time of year. 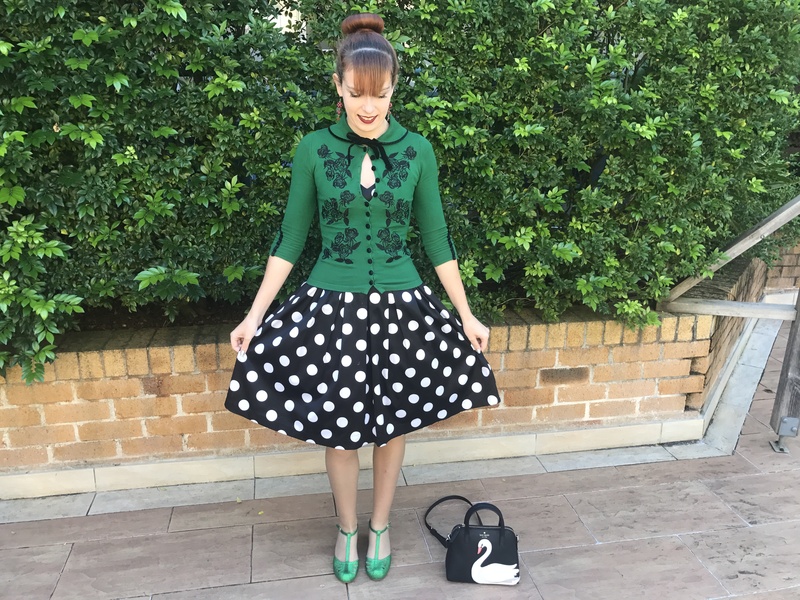 This entry was posted in BAIT Footwear, Kate Spade, Outfits, Review Australia, Wheels & Dollbaby. Bookmark the permalink. The the color and patterns combo, such a cute outfit! You look great:) The Dita really suits you. And Happy Easter to you as well. Next to Christmas, it’s our fave time of the year as well. I absolutely adore this color on you Imogen! Oh! I love this combo! I’ve been thinking in investing in one of her sweaters. I’m glad to hear you have it in multiple colors. I think I’m going to take the plunge and purchase it! Do you have an affiliated link for it? I have to agree with you it’s perfect for all sort of dresses and outfits! 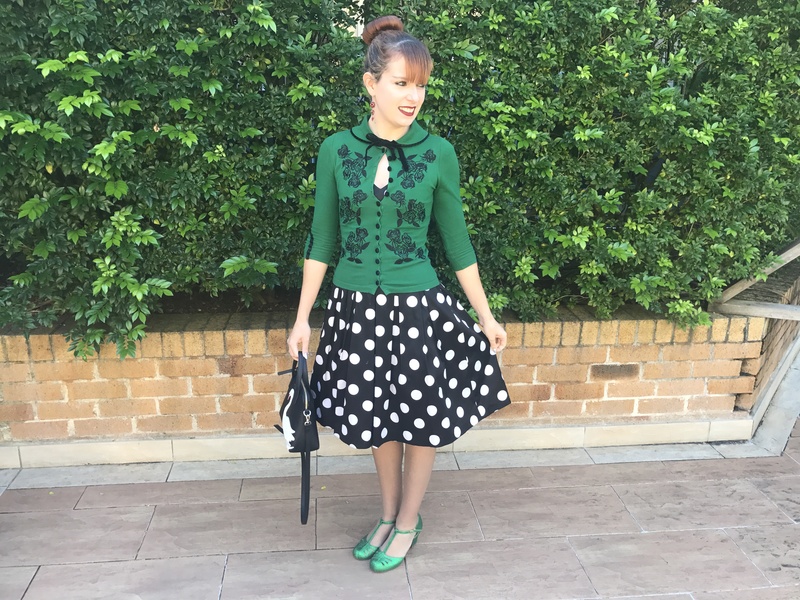 This green blouse is so cute and the polka dots are lovely! 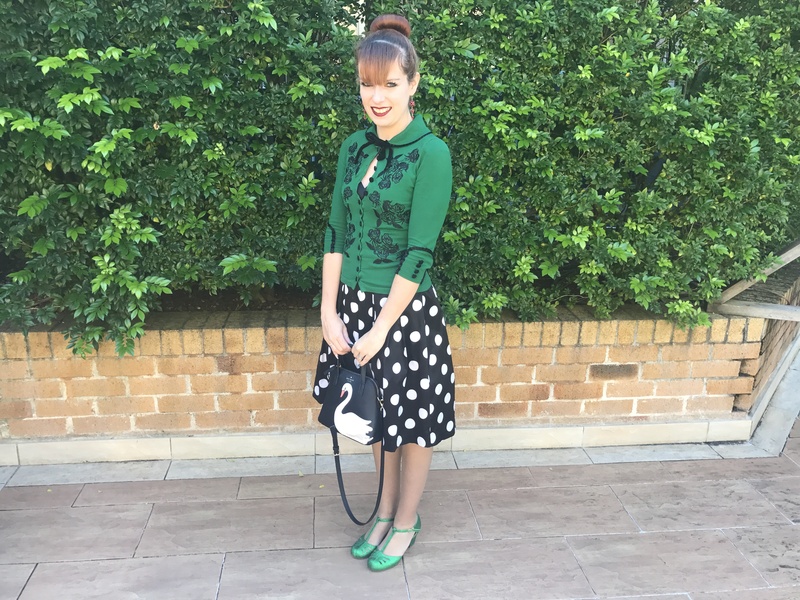 😊I do love this outfit in emerald green, so perfect for spring! I am so proud that you are training! Happy Easter to you and your fam. You look gorgeous! Oh yes, you do need a post about this bag, what a cute one! Seems like you had a very happy birthday if that was one of your gifts! 🙂 I like your outfit too, the green is nice with the black and white. I’ve always thought you looked lovely in green, Imogen. Those glitter shoes are so cool. You know, I’m very partial to the color Emerald, as it is my birthstone (May). 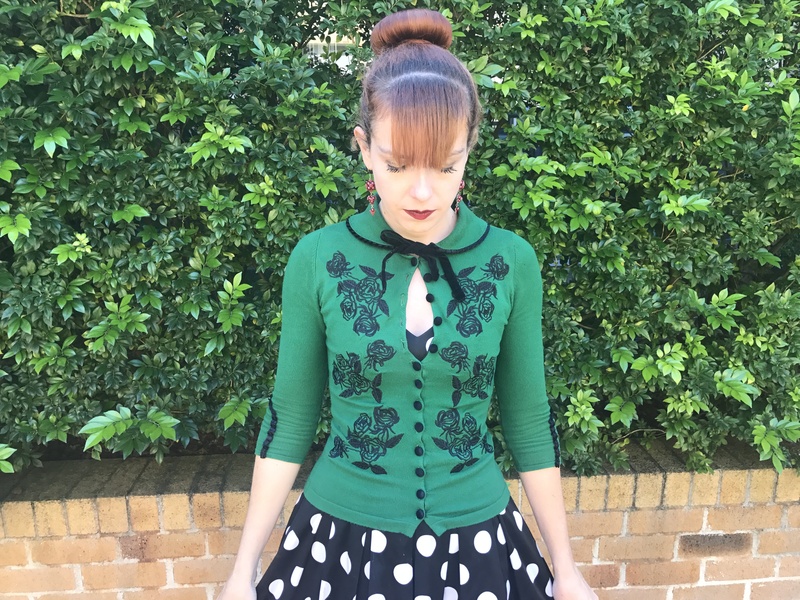 Your polka dot dress goes well with the cardigan. Have a nice Friday and weekend, Imogen. The patterns work really well together, love it! And that colour really suits you. Lovely outfit! ove the top so much!